Syria's Famed 'White Helmets' Group Says It's Being Targeted In New Offensive : The Two-Way Warplanes were pounding rebel-held areas of the northern city of Aleppo, and a group of volunteer search-and-rescue workers known as the White Helmets says its centers were targeted by airstrikes. White Helmet rescue volunteers work at the site of airstrikes in the rebel-held al-Mashhad neighborhood in eastern Aleppo on Wednesday. Warplanes were pounding rebel-held areas of Aleppo hours after Syria's government launched a new offensive amid the collapse of a cease-fire earlier this week — and internationally renowned rescue volunteers say their centers are being targeted by the airstrikes. The regime announced the offensive on state media Thursday. "A Syrian military official said airstrikes and shelling in Aleppo might continue for an extended period and the operation will expand into a ground invasion of rebel-held districts," The Associated Press reported, quoting Syrian state media. 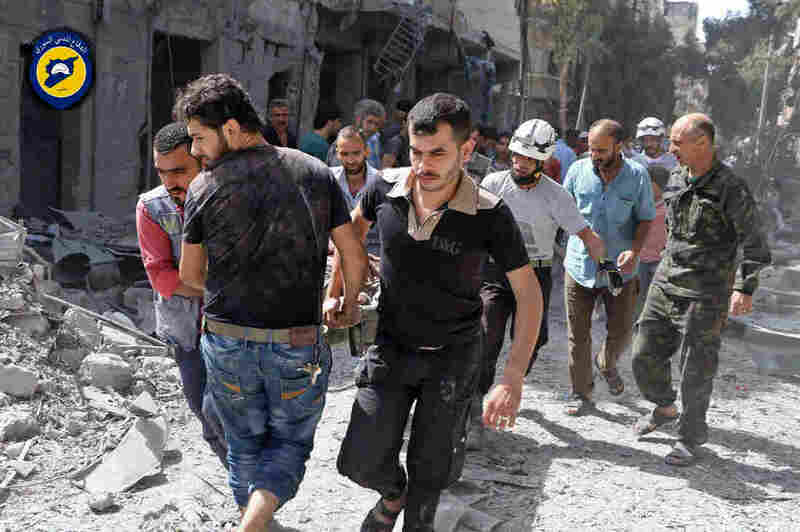 Rescue volunteers with the Syria Civil Defense — a group known as the White Helmets that was recently nominated for the Nobel Peace Prize for saving lives during more than five years of war — reported that three of its four centers were targeted Friday morning. Two of those centers, the volunteers say, were put out of service. The White Helmets posted photos on Twitter showing piles of rubble and shattered rescue vehicles. They reported 60 airstrikes in east Aleppo, the location of rebel-held neighborhoods in the divided northern city. White Helmets member Ammar Selmo told Alice that he believes the group was "deliberately targeted," and says he "intercepted pilots' communications and heard them getting orders to bomb his colleagues." The airstrikes against their facilities have made it more difficult for the rescuers to help other people impacted. "Up to now there is complete families under the rubble. Dead bodies," Selmo said. Alice reported on All Things Considered that local residents say the new offensive brings the violence in Aleppo to a new level. "There is an unprecedented escalation in the air campaign," Assaad al Achi, the head of a local civil society group called Baytna, told Alice. Regime loyalists are using bombs that create craters five feet deep, al Achi said. "They're the biggest thing we've seen since the beginning of the violence, not in Aleppo and not anywhere else," he added. The Syrian Observatory for Human Rights, an opposition-leaning monitoring group, also reports heavy aerial bombardment from Syria's Russian allies. The group says that at least 27 people were killed. This comes as the U.S. is trying to revive a weeklong truce that fell apart on Monday. It was brokered by Russia, which supports the Syrian regime, and the U.S., which supports opposition fighters. In a recent interview with The Associated Press, Assad blamed the U.S. for the end of the cease-fire, saying the U.S. is "not genuine regarding having a cessation of violence in Syria." As NPR's Alice Fordham has reported, the U.S. says it is still trying to negotiate with Russia to restore the truce.